SteelSeries Apex M500 Keyboard Review | Nerd Much? When it comes to gaming online, a keyboard can easily make or break you. There are a lot of choices out there to choose from, but ultimately, you have to know where your money is going. Some models skimp out on the quality of materials so that they can go heavy on the flashy features. The Apex M500 from SteelSeries does the opposite. You won’t find a whole lot of bells and whistles. Instead, you’re spending money on a high-quality build that promises you reliability in the heat of the fight. 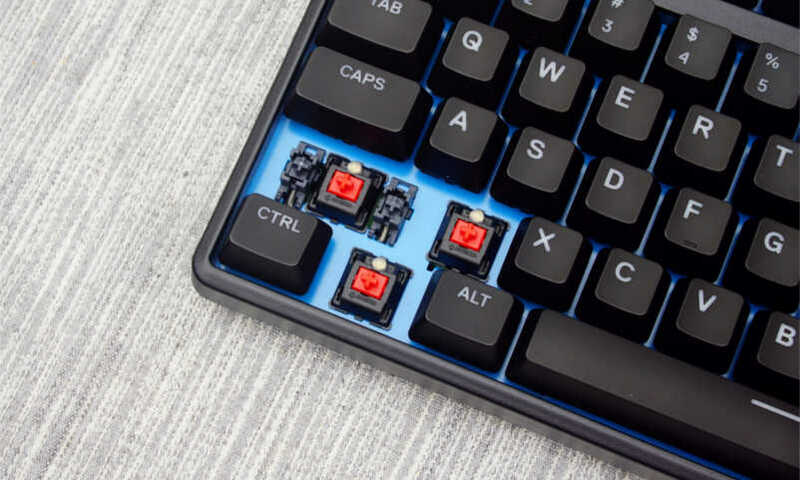 The main selling point of the Apex M500 is its Cherry MX Red mechanical switches. These guarantee a lifetime of 50 million keystrokes. Of course, we couldn’t quite reach that. After a week of heavy use, each key feels just as new as when we first unwrapped it. With fast, aggressive presses during an online match, the M500 is certainly built to last. In a technical sense, the Cherry MX Reds require an actuation force of 45 grams. They aren’t as loud as some other keys, but they will still offer enough noise and pressure to make your keystrokes feel impactful. All these fancy keys wouldn’t mean much if they couldn’t handle fast inputs. Luckily, the keyboard offers anti-ghosting with 104 key rollover. Basically, this means that it can register up to 104 inputs simultaneously. While none of us have that many fingers, it’s nice to know that we won’t ever run into issues while gaming. Another small, yet important feature is the Apex M500’s cable management. There are three guides built into the sturdy base of the keyboard. This allows the cord to come out of the middle, left, or right. While this seems completely obvious, there are too many keyboards that completely overlook this feature. It’s important for keeping your desk clean and free of long wires. As with all SteelSeries’ products, you can use their Engine 3 Software to fully customize your experience. Here you can tweak any key combination, individual inputs, and more. Not everyone will use this feature, but it is there for those that need it. Here is where we come to our only complaints about the M500. Many products from SteelSeries feature LED lighting. This keyboard is no different. What disappointed us is that you are stuck with blue backlighting here. If you have a customized set-up at home, the blue might conflict with whatever colors you have already chosen. We admit that this is a bit nitpicky, but with as much time as we gamers spend on our rigs, we like everything to look perfect. These LEDS lead us to our other minor complaint. 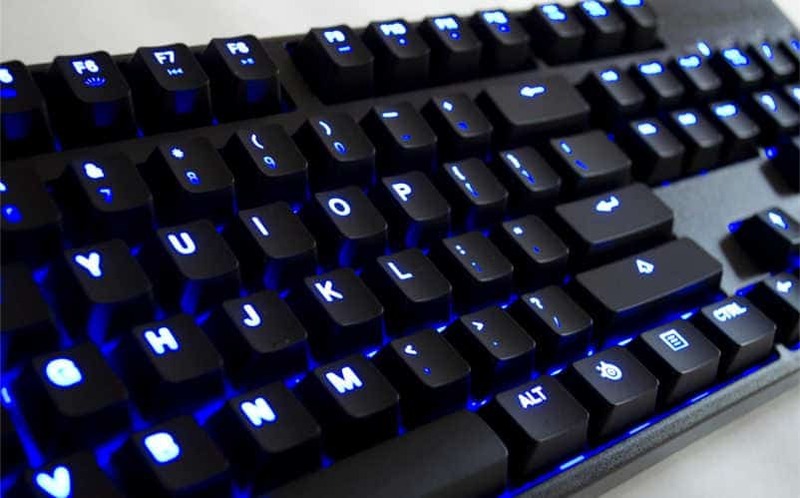 Due to the light placement, it can be hard to read some of the keys with multiple symbols. The upper symbol shines prominently, but the lower is so dull, that you may find yourself losing your place. Most of us can type with our eyes closed at this point, but we all know there is at least one symbol we lose track of. The Apex M500 from SteelSeries is a great package for its $99 price tag. No other keyboard is going to feel as heavy and robust at this price. To get such a premium build, you’re going to have to sacrifice a few customization options like infinite colors. If you are looking for a tough, reliable keyboard that will likely outlive your PC, this is the keyboard for you. + Keys are incredibly responsive. – Only available in blue. – Issues lighting multiple symbols per key.